Happy Black Friday! Do you usually go out shopping today? I’ve never been a black Friday shopper…I prefer to shop in my jammies from the comfort of my couch. Did you score any awesome deals today? Let me know what you got! In our family, it’s our tradition to get our Christmas tree and decorate it the day after Thanksgiving. 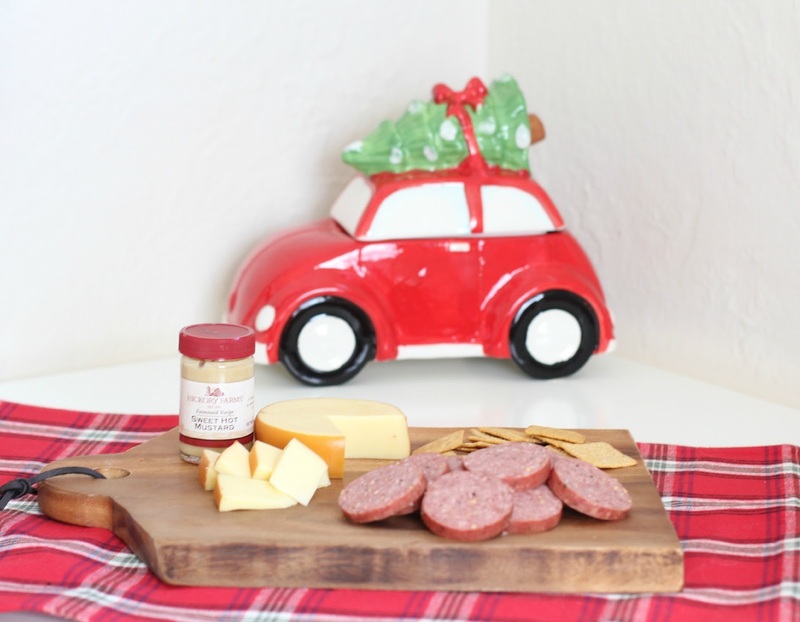 But today, my husband had to help his parents move…..so instead, my mom and I are listening to Christmas music with the kids and enjoying a yummy Hickory Farms sausage and cheese spread! We’ll get our tree tomorrow (hopefully)! Seriously so yummy! It’s not the holidays unless you see Hickory Farms set up at your local mall. Am I right? Hickory Farms is America’s most famous holiday food gift brand, enjoyed by holiday shoppers seeking the perfect gifts for family and friends for over 60 years. I’m thinking that enjoying some sausage and cheese will become a new holiday tradition. 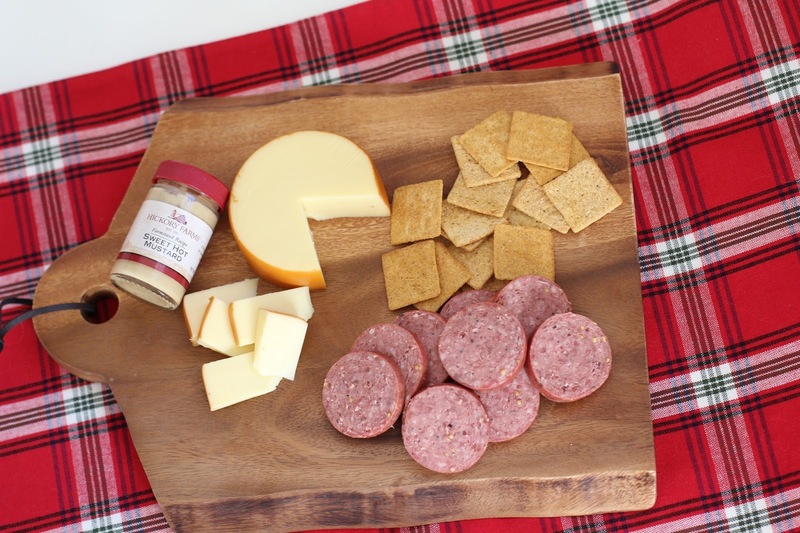 Hickory Farms’ food gifts are available at Holiday Market locations nationwide, their website, and at leading retailers. While we are enjoying our sausage and cheese we are also plotting my Elf on a Shelf strategy! This is the first year we’ve had an elf and I think Hudson is going to get a huge kick out of hunting around for our elf. If you have any easy and fun ideas let me know! 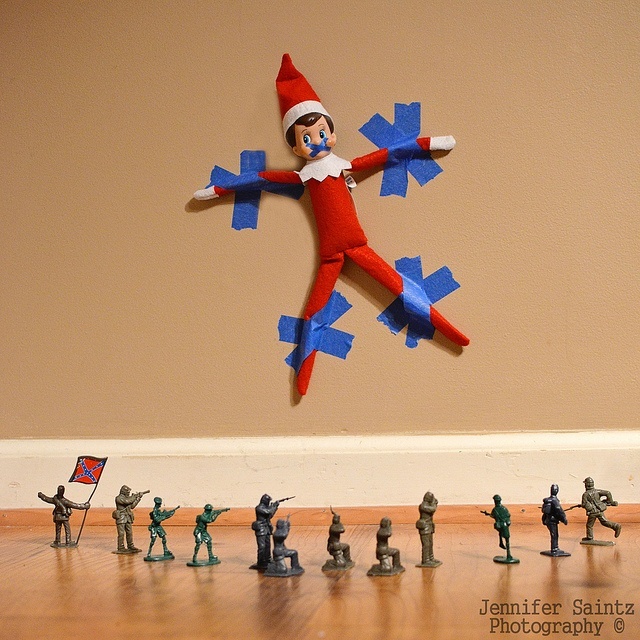 I found some great ideas here…but the elf being held hostage might be my favorite. 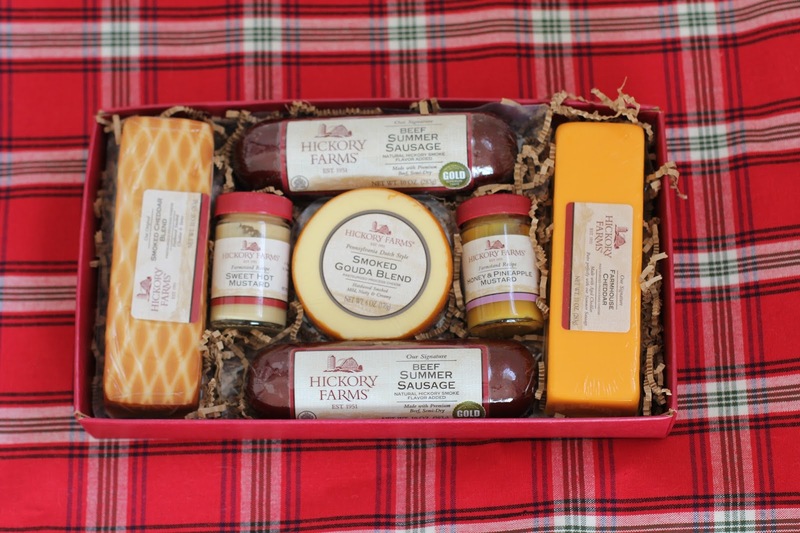 Want to win a Hickory Farms Sausage and Cheese Gift Box just like mine? Enter below! My grandma used to work at the Hickory Farms stand in the mall every Christmas. Whenever I see their products, I think of her. We're putting out tree up tonight too! Hope you had a wonderful Thanksgiving! I scored a new tv for the family and some pajamas for all of the kids. i am in Canada and even though we don't celebrate black Friday the same way you guys do more and more of our Canadian stores have great black Friday deals. I have not gotten anything really. Saved 60% on Little Passports that I got for my daughter for Christmas. We do the Elf thing, we start December 1st and its quite fun…for them, I am usually scrambling that night looking on pinterest for ideas before I go to bed…Hudson will love it! scored some toys for my grandson! the elf riding on the ceiling fan is always good for a laugh! Im with you- I stay home and decorate for Christmas! And Im happy to report Im all done (only 3 hours later lol) Hope you had a wonderful Thanksgiving! No Black Friday shopping here! Online is the way to go (hey, Amazon prime!). Hahaha! That Elf set-up is so cute! I think we're going to do the Elf thing this year too. I need something to get Mac to nice to his sister and share and I'm totally not above manipulation. I scored some awesome deals on clothes! On black friday all I got was a pretty poinsetta plant. It was 20% off though. I did my Black Friday shopping earlier in the week online and got most of my Christmas shopping done! I like when the elf builds a snowman with marshmallows. new cookware. this is our first year with an elf as well! I didn't really hit up any great black friday deals…we just stayed home! And I haven't done Elf on the shelf (man, lamest comment from me ever! ), but we're planning on starting next year. I was mad that Home Depot didn't put their kissing balls on sale for Black Friday so I went to AC Moore and decided to make my own! No kids yet (one on the way) but I know my husband will be the best elf on the shelf-er ever. We have one for when his nieces come over and he is ridiculous!